Lawyers and health professionals have expressed major concerns about the Named Person information sharing bill. Giving evidence to the Scottish Parliament’s Education and Skills Committee, Kenny Meechan representing the Law Society of Scotland said teachers and other professionals who have to navigate the complex proposals “will need their lawyer on speed dial”. Janys Scott QC, on behalf of the Faculty of Advocates, told MSPs that if families don’t know what professionals are going to do with their personal information it may affect what they are willing to share. She gave the example of a mum who may be hesitant to talk about her post-natal depression with medical professionals if she thinks it might be fed back to her child’s teachers. NO2NP has long argued that the invasive Named Person scheme would damage trust between families and professionals. Both lawyers said the Scottish Government’s current plans could result in further legal challenges. The lack of definition of the term “wellbeing” remained a central problem, and concerns were raised about potential confusion over the threshold for intervention by a Named Person. The Faculty’s written submission to the Committee highlighted “two principal issues” that had been identified by the Supreme Court: “The first was that there was a serious lack of clarity for those implementing the legislation and the second was the lack of safeguards for those affected”. 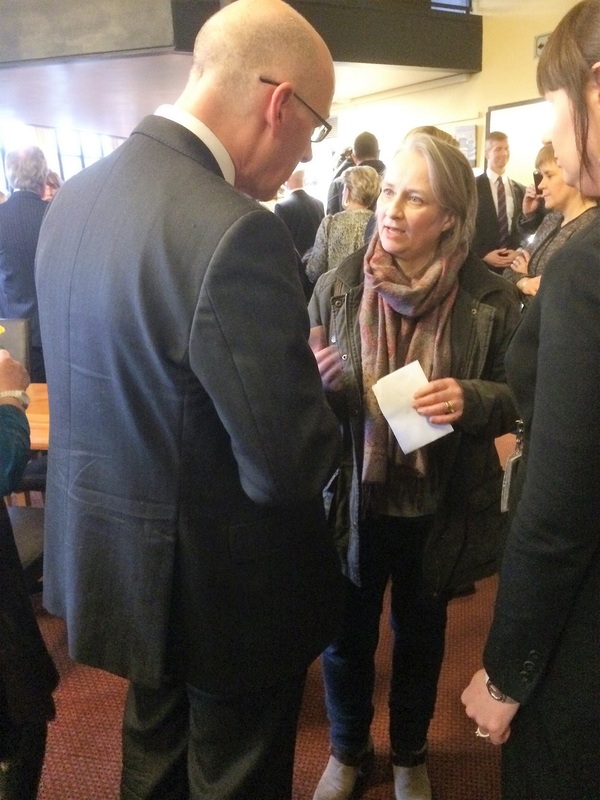 Yesterday Education Minister and Deputy First Minister John Swinney was grilled about the Faculty’s concerns. MSPs on the Delegated Powers and Law Reform Committee asked why he was snubbing the nation’s leading lawyers. Health professionals were also invited to give evidence to the Education and Skills Committee today. Royal College of Nursing Scotland’s Policy Officer Lorna Greene said the ‘duty’ on professionals to ‘consider’ sharing private information on families could have “quite a significant impact in the form of leading to defensive practice”. She warned that by putting in the duty to consider they were “leading professionals towards what might become a tick-box exercise and which could take away from meaningful practice” and commented that it was a “very vague strange concept”. Swinney told MSPs yesterday that “the law must be crystal clear”. It seems to us and to anyone who is listening, that the law in its current form is anything but clear. 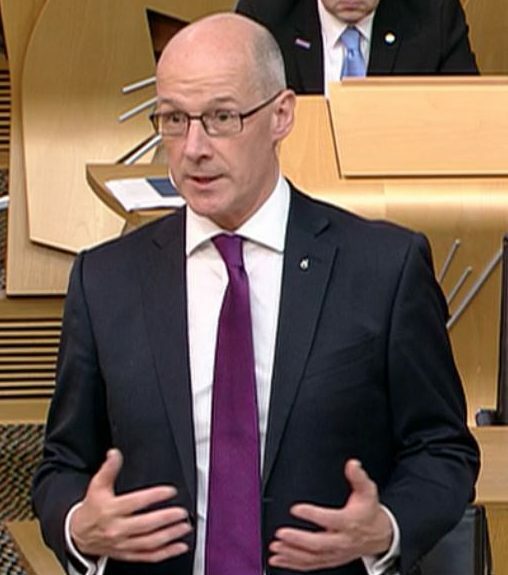 Deputy First Minister John Swinney announced yet further delays to the Named Person scheme in a statement to the Scottish Parliament today. He proposed bringing forward a bill that would include new Named Person data-sharing provisions, in an attempt to address concerns raised by the Supreme Court last July. Setting out a proposed timetable he said the bill would be expected ahead of the summer recess with the view of commencement in 2018. This is simply a restatement of the existing law. This is what we argued for in the Supreme Court, and the judges agreed with us. “However they try to spin it, this is a major climbdown by the Scottish Government. “After two years of causing fear and confusion amongst parents, they are now conceding that they cannot lower the threshold for non-consensual disclosure of personal information on families. “They are reverting to the existing threshold of ‘risk of harm’. “It all goes to show what a complete waste of time and money it has been to try to create a system to allow officials to pass round confidential personal information on children and families almost at will. 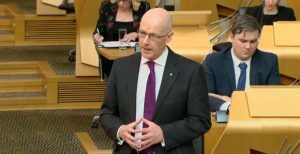 “Mr Swinney says he is going to create a new statutory duty on Named Persons to comply with their existing statutory duties in the Data Protection Act and Human Rights Act. This is pointless and superfluous. It is little more than a face-saving exercise for the Scottish Government. “Ever since they lost in the Supreme Court the Scottish Government has been trying to downplay the significance of the ruling and, in particular, of their data sharing provisions which the court said breached human rights. “This ‘central’ element of the scheme is now history. “On the day of the ruling in July last year they were telling the BBC they hoped to roll out the system before the end of the 2016. By September were talking about an ‘ambition to work towards August 2017’. Now they admit it will take until 2018. NO2NP supporters also commented on the announcement. Lesley Scott, Scottish Officer for Tymes Trust, said: “Mr Swinney in his statement to Parliament today on the proposed revisions to the Named Person legislation repeated many of the familiar arguments that have already been thoroughly demolished over the past three years. “Not least of these was his claim that ‘wellbeing is defined by the Children & Young People (Scotland) Act 2014’. Either Mr Swinney has not read the full ruling from the UK Supreme Court or he is being wilfully misleading. The judgment from the Supreme Court states clearly on page 8: ‘Wellbeing is not defined’. “I welcome the publication of today’s judgment and the fact that the attempt to scrap the named person service has failed. 2. 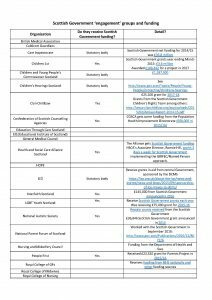 On its introduction in April 2013, the Children and Young People (Scotland) Bill was accompanied by a Policy Memorandum which was similar in content to the consultation paper. It provided for a wide-ranging duty on all relevant public authorities to cooperate with the named person in the conduct of their duties. This would be of particular importance in the area of information sharing, since the “role of the named person will depend on the successful sharing of information between relevant public authorities” (para 73). 4. 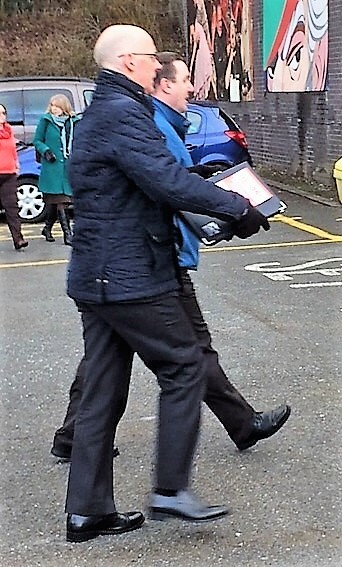 It appears, therefore, that one of the principal purposes of Part 4, as envisaged at that stage, was to alter the existing law in relation to the sharing of information about children and young people, so as to enable information about concerns about their wellbeing, held by individual bodies, to be pooled in the hands of named persons and shared with other bodies, with the ultimate aim of promoting their wellbeing. 78. … while article 8 is engaged, not all that may be done under Part 4 would involve an interference with a person’s article 8 rights. 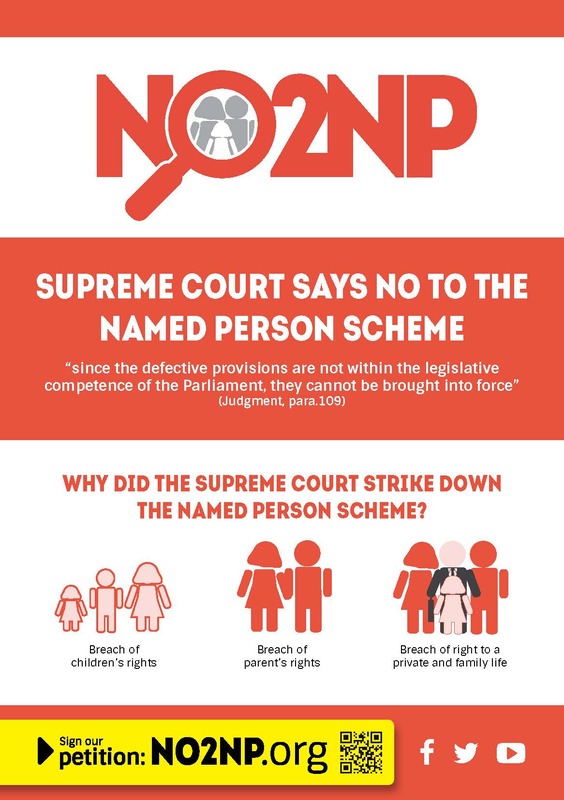 There are elements of the role of the named person which are unlikely, by themselves, to involve any interference with the right of a parent, child or young person to respect for his or her private and family life. Thus, by themselves, the functions in section 19(5)(a)(i) and (ii) of providing advice, information and support and helping the parent, child or young person to access a service or support would not normally constitute an interference with the article 8 rights of either the child or his or her parents. But it is clear from the consultation paper, “A Scotland for Children” and the Policy Memorandum, which we discussed in paras 1 to 3 above, that the sharing of personal data between relevant public authorities is central to the role of the named person. As we have explained, this may well constitute an interference with the article 8 rights of those to whom the information relates. We are therefore satisfied that the operation of the information-sharing provisions of Part 4 (in particular, sections 23, 26 and 27) will result in interferences with rights protected by article 8 of the ECHR. The question therefore arises whether such interferences can be justified under article 8(2). We have received complaints from numerous parents whose approaches to Mr Swinney were effectively ignored. In response to personal emails to Mr Swinney telling their stories and asking him to hold public meetings, all they got was a short, dismissive, unsigned stock reply from an unnamed official. Polls show that only 24% of the population think every child should have a Named Person. By refusing to speak to anyone representing the overwhelming majority who don’t back their policy, the Government closed the door on advice which could help them to avoid more catastrophic blunders. Despite this, NO2NP encouraged its supporters to email the Government anyway, which they did in their hundreds. Here is the list of those the Government says it “engaged”. Note how many are in receipt of Government funding. The Scottish Government has thrown a veil of secrecy around stalled efforts to salvage its Named Person scheme after judges declared their original plans illegal. But two months into 2017 there have still been no updates from the Government. A standard reply letter saying the Minister will return to Parliament “in the new year” is still being issued by officials. 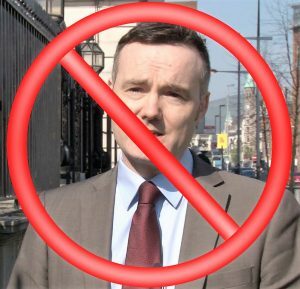 A NO2NP supporter filed a Freedom of Information (FOI) request last month in a bid to secure access to the minutes of these “engagement” meetings since August last year. Normally such minutes must be made public, but officials blocked their request, exempting the Government from handing over the data “because we intend to publish that information within 12 weeks of the date of your request” (12 January 2017). Lesley Scott of Tymes Trust, who submitted the FOI request, said: “It would seem that the Scottish Government has learnt nothing over the last 3 years and is determined to repeat the same mistakes that ended up in them losing in the UK Supreme Court last year. 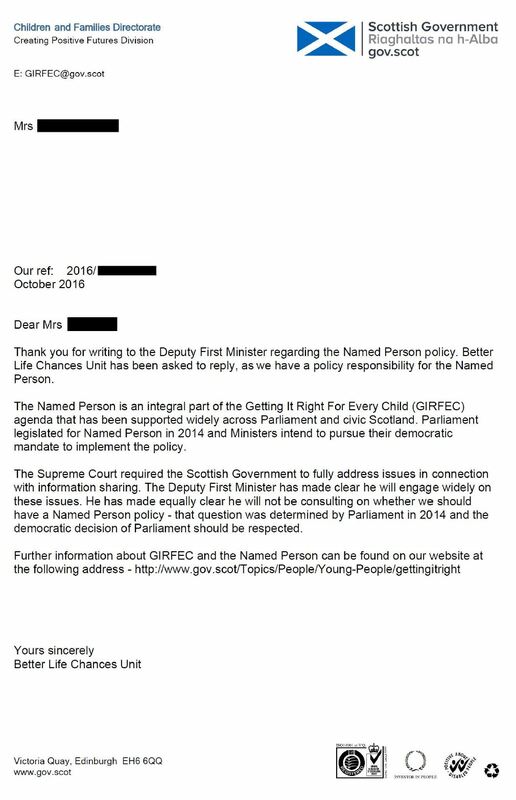 “Not only did they bar anyone who disagrees with the Named Person scheme from taking part in the ‘intense engagement’ in the first place, they are now refusing to even let us know what was said. 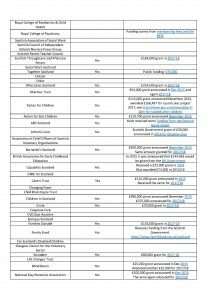 “The engagement period was really a sham consultation because Mr Swinney only wanted to deal with those who support the scheme and organisations mainly funded by the Government. “He refused to engage with us even though we represent an important cross-section of Scottish society, huge numbers of parents and more than 35,000 people who signed our petition. We have led the public discussion on this issue for two years – we even won an award for our campaign – yet he won’t meet with us. “It just shows how difficult they are finding it to salvage their Named Person plans. The initial Government reaction to the Supreme Court ruling was to pretend we’d lost our challenge – a classic example of spin and denial. On Monday this week, around 200 local residents from across Perth and Kinross attended a public meeting hosted by the Scottish Cabinet at Pitlochry Festival Theatre. 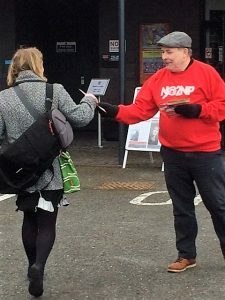 The purpose of the meeting was to enable local residents to air their concerns about issues affecting them so, since the Scottish Government’s imposition of a Named Person will affect every single family with children under 18 in Perth and Kinross (as well as the rest of Scotland), NO2NP volunteers were there to greet them. The flyer that most people took summarises what the Supreme Court judgment achieved last July in stopping the unpopular legislation in its tracks. In a nutshell, the Named Person’s blanket powers to ‘grab and share’ data on families were unanimously struck down by the judges. One gentleman had not heard of the campaign but as soon as he was told, he was enthusiastically in support of it. Another delegate’s outraged response at the scheme was another example of how angry people are at the imposition of such a scheme on every family in Scotland. Especially when it was never consulted on or requested by the vast majority of Scottish parents. Even Deputy First Minister John Swinney took a leaflet – we hope it will remind him that he still needs to make his announcement on the future direction of revised Named Person legislation in light of the Supreme Court’s damning judgment. There were lots of questions asked at the meeting and sadly there wasn’t time for everyone to ask their questions publicly. But, to their credit, the Cabinet met delegates over tea and coffee afterwards, and local NO2NP supporter Lesley Scott took this opportunity to ask the Deputy First Minister her question. She wanted to know why the Scottish Government had not told Perth and Kinross Council to remove inaccurate data sharing guidance from their website, since they had removed it from their own. The Council made the excuse that the Scottish Government had not told them to remove it. 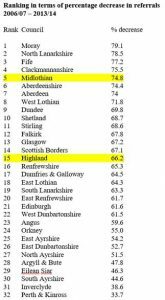 Mr Swinney argued that each local authority was an elected body that was autonomous in its decision-making – but Perth and Kinross Council don’t seem to think so…! “Does the Information Commissioner’s Office have the power to tell the Council to remove it?” Lesley then asked. The Deputy First Minister agreed to look into the matter, so we’ll be keeping an eye on developments. In the meantime, preparations are well underway for a major NO2NP event in Edinburgh on Monday 20th March, so make a note in your diaries now – more details to follow soon! You would perhaps expect to see ‘utopian’ ideals populating the pages of fiction, but not perhaps on the floor of the Holyrood chamber or in front of a Parliamentary Committee. 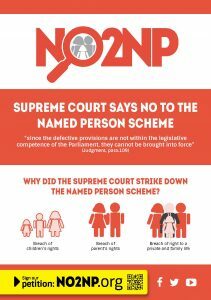 But when it comes to the Named Person scheme, the normal rules don’t apply. Highland Council is often wheeled out by proponents of the Named Person scheme as Scotland’s utopian ideal. It’s frequently used as ‘evidence’ of the scheme’s success, and the reason for a nationwide roll-out. And this time it was Deputy First Minister John Swinney’s turn to spin the wheel. In front of not only the Holyrood chamber but again in the Education and Skills committee, Mr Swinney confidently stated some impressive sounding stats about a drop in referrals to the Children’s Reporter in Highland. Predictably, he attributed the success to Highland’s Named Person pilot scheme. But as the saying goes… the devil’s in the detail. You may be surprised to learn that Mr Swinney’s stats did not paint the whole picture. What he didn’t tell you was that in the same time period there was a drop in referrals across Scotland. 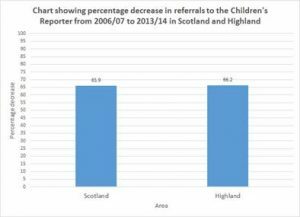 In fact many local authorities which did not have a Named Person pilot scheme saw an even higher percentage drop in referrals. Highland was not even close to being an isolated case study. 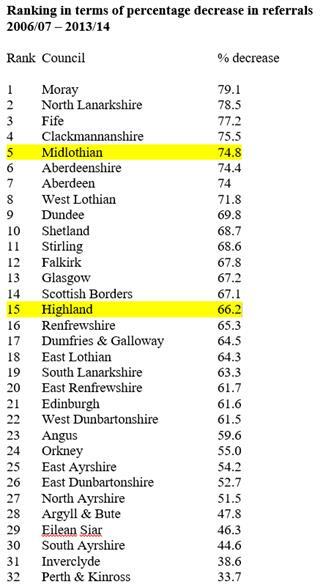 Highland’s figures were only mid-range in comparison to the rest of Scotland. There is therefore no evidence to suggest a link to the Named Person pilot scheme. It’s time to wake up from the utopian dream and face reality: Highland is not the model and inspiration for the national Named Person scheme that Mr Swinney and others would like us to believe. Deputy First Minister John Swinney has been accused of arrogance for ignoring concerned parents and constituents over the Named Person scheme. Large numbers of parents contacted Mr Swinney in his capacity as education minister, urging him to hold public meetings where he can be questioned over the Named Person, following the Supreme Court ruling against the scheme earlier this year. But parents have been disappointed to receive anonymous, dismissive, standard replies from a Government department calling itself the ‘Better Life Chances Unit’. After the Supreme Court defeat, Mr Swinney pledged a three-month period of “intense engagement” – including parents and those with ‘concerns’ – in a consultation process designed to come up with alternative proposals which might meet the approval of the court. But he ruled out meeting with NO2NP, whose members warned more than two years ago of the problems with the scheme, and brought the legal action which resulted in the Named Person law being struck down. It has now emerged that Mr Swinney’s office has failed to properly respond to parents, including some of his own constituents, seeking to become involved in the consultation process. “We have received complaints from numerous parents whose approaches to Mr Swinney were effectively ignored. In response to personal emails to Mr Swinney telling their stories and asking him to hold public meetings, all they got was a short, dismissive, unsigned stock reply from an unnamed official. “Even Mr Swinney’s constituents who wrote to him have been ignored by their own elected MSP. “We’re one month in to his three-month period of ‘intense engagement’. I don’t know who he is speaking to, but it’s certainly not ordinary parents. “Parents feel frustrated and disappointed to be treated with such arrogance by a minister. He said he would hold an ‘open’, ‘inclusive’ dialogue which would include parents and those with concerns. These parents wrote to him within a week of that announcement. Civil servants took a month to come up with an anonymous 166-word reply that makes clear they are simply not interested in the opinions of anyone who does not support Government policy. A warning about information sharing practices has been issued to local authorities and health boards by the Scottish Government, following the Supreme Court ruling. 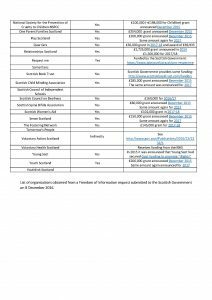 In a statement released at the weekend by the Scottish Government it was disclosed that Named Persons have been told to “take care to reiterate the voluntary nature of any advice, information, support or help offered”. This latest development is in contrast to last week’s public response from Deputy First Minister John Swinney, in which he claimed a Government ‘victory’, despite the judgment rendering the Named Person legislation unlawful. The statement also revealed that Swinney had begun talks with “senior figures from the public and third sectors including NHS, local authorities and Police Scotland to discuss our next steps”. Commenting on the news, a NO2NP spokesman said the group was “sad and disappointed” that Swinney was only consulting with “those who support his government’s policy”. Following the Supreme Court decision last week serious questions have been raised over the prospect of parents suing councils which have been operating pilot schemes. The Government has confirmed that it will delay the implementation of the Named Person scheme in the event that there is no ruling from the Supreme Court before the proposed 31 August roll-out date. The Supreme Court rises for its summer recess on Friday 29 July – less than three weeks away. Lawyers approached the Government last Wednesday to request a stay on the implementation of the scheme if a decision was still pending ahead of the planned roll-out date. Deputy First Minister John Swinney conceded that it “would not be prudent or responsible for government to commence legislation while a decision from the court is still pending”. NO2NP spokesman Simon Calvert said: “Our lawyers contacted the Scottish Government earlier this week requesting an undertaking along these lines, so we are pleased they have done the right thing. “The fact that the Scottish Government has been forced into a concession over this unpopular scheme is an acceptance of the reality that it could actually be struck down by the Supreme Court.